What do you get when you mate a Leica M with a table tennis paddle? 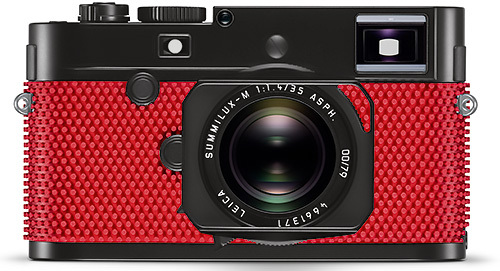 The Special Edition M-P Grip by artist and Leica photographer Rolf Sachs. But only 79 of them will be produced, so don't get too excited. 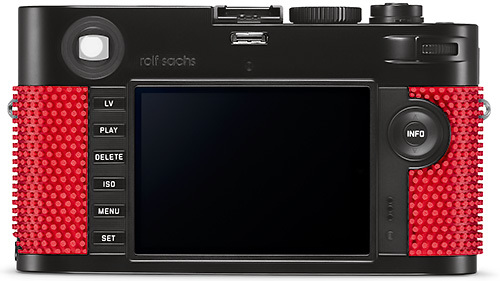 Sachs focused on the Leica M-P rangefinder camera in black paint finish, wrapping it with the stuff table tennis paddles rely on to give a spin to ping pong balls. Elements on the top deck of the camera echo the color scheme rather than the usual white paint. A Rolf Sachs logo graces the back of the top deck as a signature of the designer. The engravings on the lens are also partially picked out in a matching red. "For many photographers over many years, the Leica M has been a passionate love affair," Sachs said. "Its functionality and iconic design attract me as an artist and an avid user. I am thrilled for the opportunity to 'undress' the camera and create a new look, which is surprising as much as it is functional. Applying a material that has never before been used as an easy-to-grip camera surface, creates a striking aesthetic and a unique tactility." The set comes in a black case containing the Leica M-P (Typ 240) camera, the Leica Summilux-M 35mm f1.4 ASPH., a special carrying strap made of cotton and a Leica SF 40 flash. The special edition also includes a special brush for cleaning the camera trim and a premium-quality brush for cleaning the exposed parts of the set. 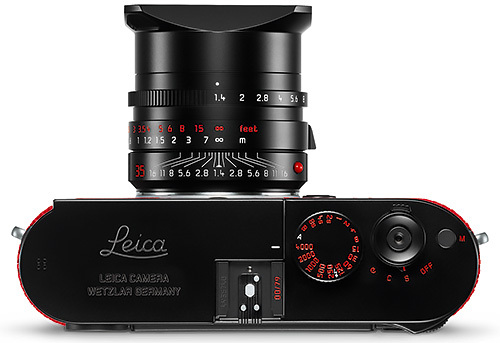 It will be available in November, Leica promised. In collaboration with artist and Leica photographer Rolf Sachs, Leica Camera presents a new special edition in the Leica M-System portfolio -- the Leica M-P (Typ 240) "Grip" Set by Rolf Sachs. The exclusive set, consisting of a Leica M-P (Typ 240) camera and the fast classic lens Leica Summilux-M 35mm f1.4 ASPH., unites legendary rangefinder technology with creative product design. The combination of unexpected materials in an eye-catching choice of colour and classic design lends the camera a unique look and makes the Leica M-P "Grip" Set by Rolf Sachs a true collector's item. This special edition will be strictly limited to only 79 sets for the worldwide market and will be available exclusively at select Leica Stores and Boutiques starting in November. "For many photographers over many years, the Leica M has been a passionate love affair! Its functionality and iconic design attract me as an artist and an avid user. I am thrilled for the opportunity to 'undress' the camera and create a new look, which is surprising as much as it is functional. Applying a material that has never before been used as an easy-to-grip camera surface, creates a striking aesthetic and a unique tactility," says Rolf Sachs. In his Leica M-P "Grip" Set by Rolf Sachs concept, the artist focused on the Leica M-P rangefinder camera in black paint finish, modifying features of its design to create the unique style that he envisaged. For the body trim, Sachs chose a material that is usually used in the production of table tennis paddles. Applied to the camera body, the red nubs of this rubber trim lend the camera a uniquely striking look -- while also creating an entirely new haptic experience. Various individual elements on the top deck of the camera are matched to the colour scheme of the Leica M-P "Grip" Set by Rolf Sachs -- the engravings on the accessory shoe, the shutter speed dial, the on/off switch, the video button and the style of the shutter release button are now picked out in red, rather than white. A 'Rolf Sachs' logo graces the back of the top deck as a signature of the designer. The engravings on the lens are also partially picked out in a shade of red. The Leica M-P "Grip" Set by Rolf Sachs set comes in a black case containing the camera, the lens, a special carrying strap made of cotton and a Leica SF 40 flash. The special edition also includes a special brush for cleaning the camera trim and a premium-quality brush for cleaning the exposed parts of the set. In all other respects, the performance and technical specifications of the camera and lens of the Leica M-P "Grip" Set by Rolf Sachs special edition are identical to those of the equivalent serial production products. The Leica M-P offers all the technical advantages of the Leica digital rangefinder system cameras and possesses the same enduring and robust qualities for which the Leica M-System is renowned. Thanks to its combination of moderate wide-angle character and natural reproduction of proportions, the Summilux-M 35mm f1.4 ASPH. is one of the most versatile lenses in the Leica M-System portfolio. From selective focus in the close-up range to high-contrast available-light applications and landscape shots with immense depth of field, the lens delivers outstanding performance in any situation. The long-standing collaboration and amicable relationship between Leica Camera and Rolf Sachs is founded on a multitude of projects. Most recently, 'Camera in Motion: from Chur to Tirano', an impressive exhibition showing his work shot with a Leica S, was on view at the Leica Galleries in Salzburg and Wetzlar. Rolf Sachs was born in Lausanne, Switzerland, in 1955. He studied in England and the USA. He found inspiration in the art around him from the early years of his youth and became an artist himself in the late nineteen-eighties. His creative genres include photography, sculpture, set-design and installations. Inspired by everyday objects and their materiality, he searches for the unusual and unconventional within them and brings it to light in the unique conceptual diction of his multidisciplinary works.